Tony and I hopped on the motorcycle and headed down the main dirt road from our rural Paraguay house. Five kilometers later, we turned onto a side road and went another five kilometers, as the houses got more and more sparse. The sun was getting lower in the sky and the cool wind blew through our hair. Tony concentrated on missing the huge potholes and skirting around the deep sandy parts. We passed some kids walking home from school in their blue and white uniforms. A few boys kicked a soccer ball across the road, enjoying a match before darkness fell. Weeks earlier, a middle-aged man had come to our house asking for an audio Bible. He said he lives in a neighboring town where we haven't done a distribution yet. We told him we want to give one to each house in his town and that we would get there soon. But before we could arrange a distribution, he came again, and then a third time. Finally, Tony gave him the audio Bible and told him we would go to his house and visit him soon. We turned off the side road and onto a smaller dirt path. It led across a pasture with a huge, branching tree. We passed through a wooden gate, then weren't sure which way to go. Luckily, a boy was walking across the field and we called out to him. "Do you know where Senor Rogelio lives," we asked. He gave some directions and pointed across the field past an abandoned house. We went through a second wooden gate, but the very small footpath dwindled to nothing. We called back to the boy who signaled again with his hands where to go. There were no houses now, just fields and forest. Soon we came to a fork in the path. Since the boy had signaled to the right we went that way, past fields of manioc, cotton, then something that looked like sweet potatoes, an unplanted field, then - nothing. The somewhat imaginary path dwindled away, and we couldn't make ourselves imagine it going any farther. We stopped the motorcycle and laughed. Reaching for the cell phone we realized there was a signal! We called Rogelio and tried to explain where we were. We retraced our tracks to the cotton field and went around it the other way. Finally, we saw him walking out to meet us. Following our friend on foot, we soon came to a clearing and a little house surrounded by forest. I was fairly certain that in the forest, just beyond where we could see, was the edge of the world. I was quite certain that when Jesus said, "I will be with you even to the very ends of the earth" he was talking about this very location. A thin woman came out of the humble, board and batten house and greeted us timidly. A high-school aged girl also came around the corner smiling at us. The woman offered us each a wooden chair and the man sat on a crude stool. 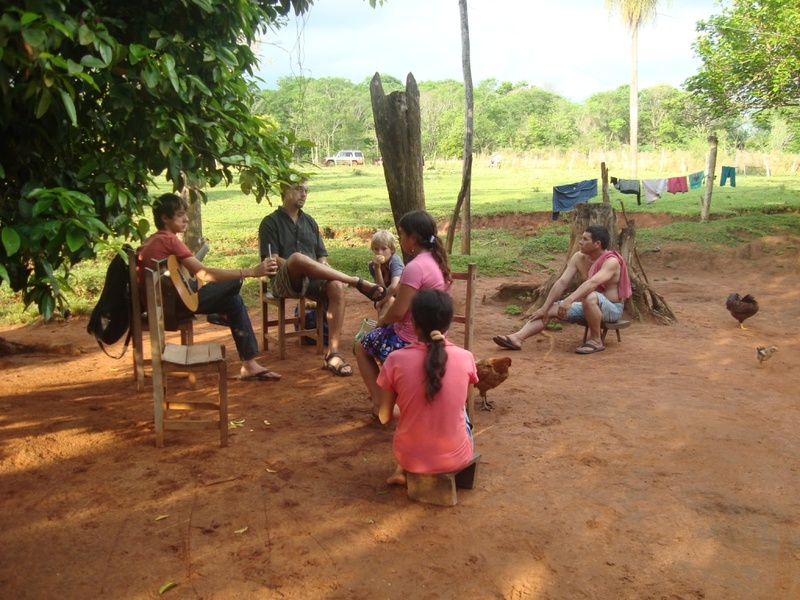 We made small talk with the family for a while in Guarani. Then we asked them how their audio Bible was working. Rogelio said it was useful because he could take it to his fields when he worked. We said we were willing to visit them every week and hold a Bible study if they were interested. Rogelio mentioned that some of his neighbors might want to come too. We agreed on a day to return and have a weekly Bible study. The sun was getting lower and our kids were home alone, so we excused ourselves to make the journey back. This little adventure is the kind of thing we do in the first stage of church planting in rural Paraguay. We are still in the tilling stage, preparing the soil for God to work. We try to connect with as many people as possible here, to find a few who are ready to learn more about Christ. Will you pray for Rogelio and his family? We know that in this Paraguayan culture a half-hearted 'yes' can actually mean 'no'. Pray that God will urge Rogelio, his family and neighbors, with a desire to know Christ. Pray that we can regularly meet with them, to show them how satisfying a true relationship with God can be.